At the end of World War II, Adm Chester W Nimitz, then Chief of Naval Operations, ordered the formation of a flight demonstration team to keep the public interested in naval aviation. The Blue Angels performed their first flight demonstration less than a year later in June 1946 at their home base, NAS Jacksonville. Flying the Grumman F6F Hellcat, they were led by LtCdr Roy "Butch" Voris. Only two months later, on Aug 25, 1946, the Blue Angels transitioned to the Grumman F8F Bearcat and introduced their famous "diamond" formation. By the end of the 1940s the Blue Angels were flying their first jet aircraft, Grumman F9F-2 Panther. In response to demands placed on naval aviation in the Korean conflict, the team reported to the carrier USS Princetonas the nucleus of Fighter Squadron 191 (VF-191), Satan's Kittens,in 1950. They were reorganized the following year and reported to NAS Corpus Christi, where they began flying the newer and faster version of the Panther, the F9F-5. 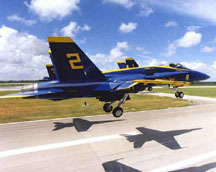 The Blue Angels remained in Corpus Christi until the winter of 1954, when they relocated to their present home base at NAS Pensacola. It was there that they progressed to the swept-wing Grumman F9F-8 Cougar. The ensuing 20 years saw the Blue Angels transition to two more aircraft, the Grumman F11F-1 Tiger (1957) and the McDonnell Douglas F-4J Phantom II (1969). In Dec 1974 the Navy Flight Demonstration Team began flying the McDonnell Douglas A-4F Skyhawk II and was reorganized as the Navy Flight Demonstration Squadron. This reorganization permitted the establishment of a commanding officer vice a flight leader (Cdr Tony Less was the squadron's first official commanding officer), added support officers and further redefined the squadron's mission emphasizing the support of recruiting efforts. On Nov 8, 1986, the Blue Angels completed their 40th anniversary year during ceremonies unveiling their new sleek McDonnell Douglas F/A-18 Hornets, the first dual-role fighter/attack aircraft to serve in the nation's front lines of defense. 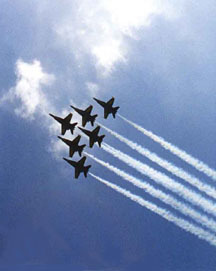 In 1992 more than a million people viewed Blue Angels performances during a 30-day European tour of Sweden, Finland, Russia, Romania, Bulgaria, Italy, Great Britain, and Spain. This was the first European deployment in 19 years. Air shows throughout the 50th anniversary schedule in 1996 attracted more than 15 million spectators, and since 1946 the Blue Angels have flown for a combined audience of more than 291 million!